I remember hanging out with a local Indonesian friend from Surabaya at a guest house. I couldn’t have agreed more. In Indonesia and other parts of Southeast Asia (and some parts of China), rice is so important, a meal without it is not a real meal at all. Growing up with a Chinese mother, I was also raised and grown on rice. But for most of my life, rice just appeared. Sure I’ve seen plenty of rice paddies and admired people as they cared for their muddy fields of rice. However, for as long back as I can remember, I pulled cups of rice out of the big bag, rinsed it once or twice, added water and pressed the “cook” button on the rice cooker. It’s really that easy. We even have a really cool Japanese style rice cooker now that keeps rice hot and fresh for 2 – 3 days! My chance finally came to learn about the process and actually take part in the preparation of rice when I spent a peaceful week by myself in the Batad rice terraces of the Philippines. 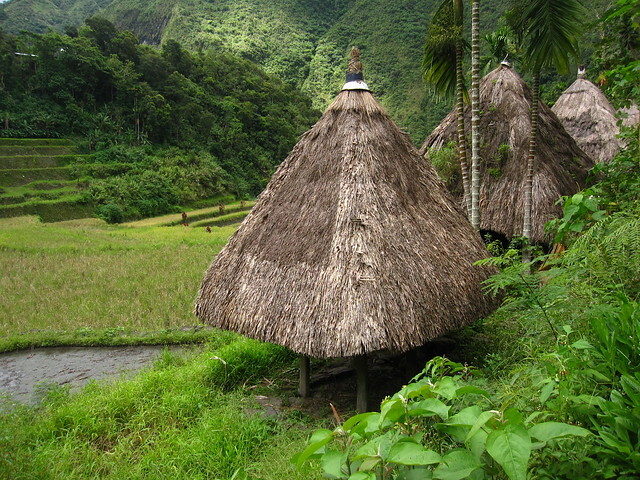 I was kind of adopted by a very friendly family that cared for the grass thatched hut that I slept in during my stay. 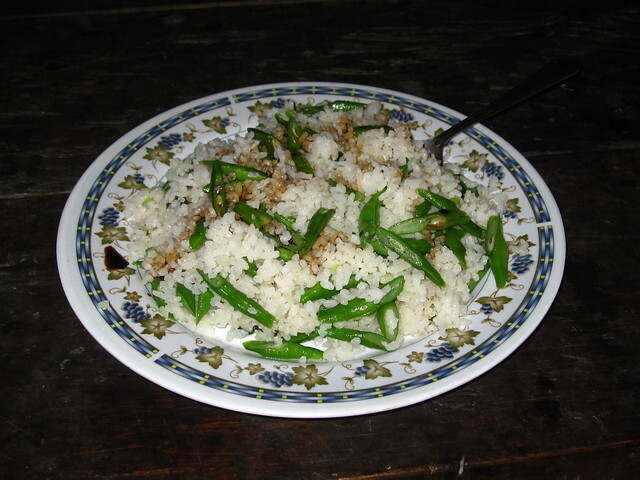 They provided me with my meals, humble plates of rice topped with small amounts of vegetables like string beans. I was amazed at the quality of their rice. It wasn't the pure white perfect and processed grains that I'm normally accustomed to. Instead the grains were broken, brownish white, and not even cooked perfectly like my rice cooker. It was rice, pure rice, home prepared, straight from the paddy to the pot to the stomach. 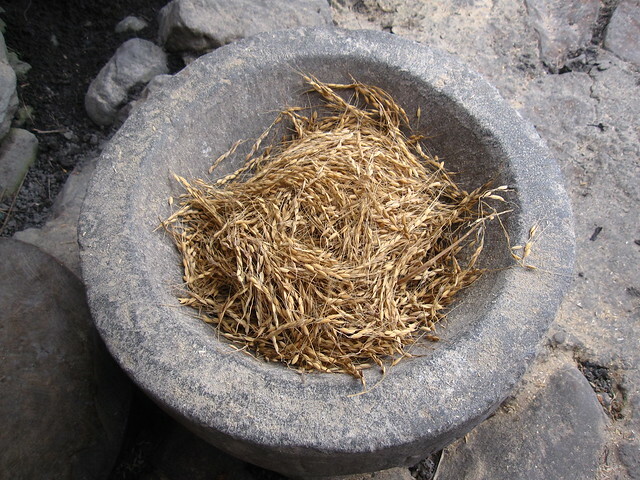 It was rice that was relied upon, that was cared for, and that was absolutely crucial for survival. Small bundles of rice set in the sun to dry. From my comforting relaxation, I asked the family if I could help them pound the rice for the day and they laughed and were excited about my enthusiasm. At this stage, the rice paddy's were already planted and flooded, so I didn't get to help in the planting process. 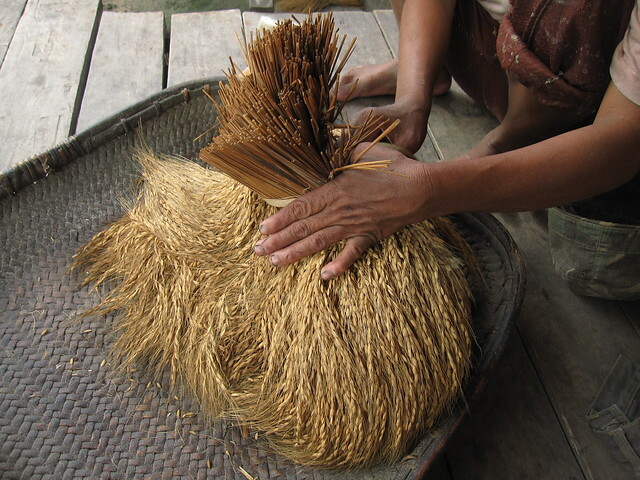 After being picked, stalks of rice are joined together into small bundles and set in the sun to dry. Kids learn to do this from a very early age. The bundles are stored in a small wooden shed, dedicated to sheltering the rice. 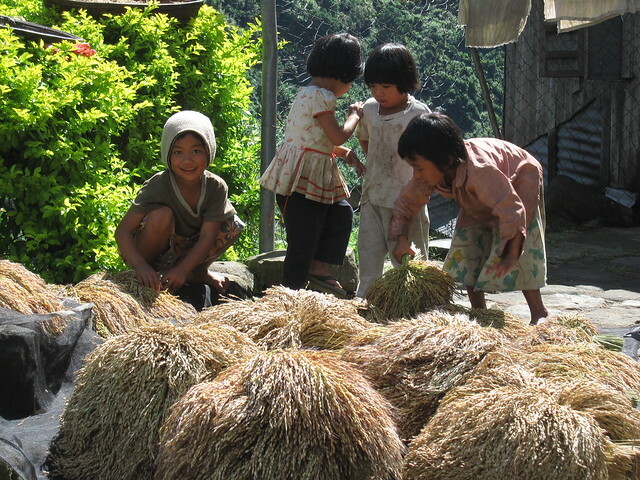 Each day the family takes a bundle of the dried rice stalks and begins the preparation process. The first step is shredding the grains off the hard stems. This seems easy, but these things are sharp and splintery. The mother's hands were callused so she shredded them with ease, however my hands were on the wimpy side. 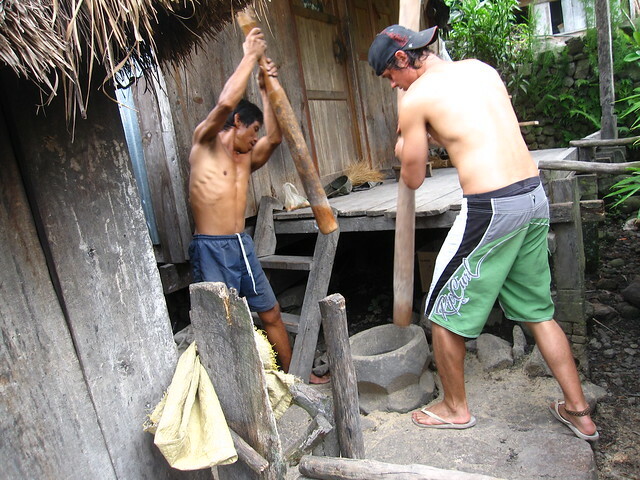 When we had accumulated enough rice grains, we put them into the grinding stone – a huge mortar. The next step was to pound the rice. Those objects we're holding are not little sticks, they are heavily weighted wooden posts that probably weighed 15 – 20 kilos each. We took tuns pounding the rice, alternating hits and continuing on for about 15 minutes. Ever so slowly I could see the grains of rice beginning to depart from their outer husk. 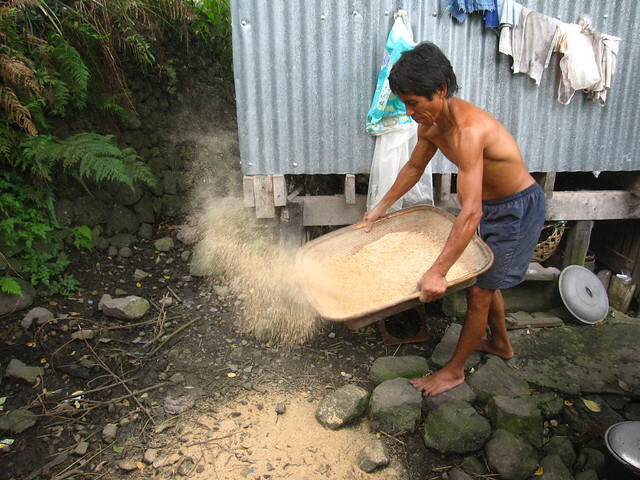 The rice was then placed in a flat basket and sifted to get rid of the loose husks. Then, we put the rice back into the mortar and started pounding again. 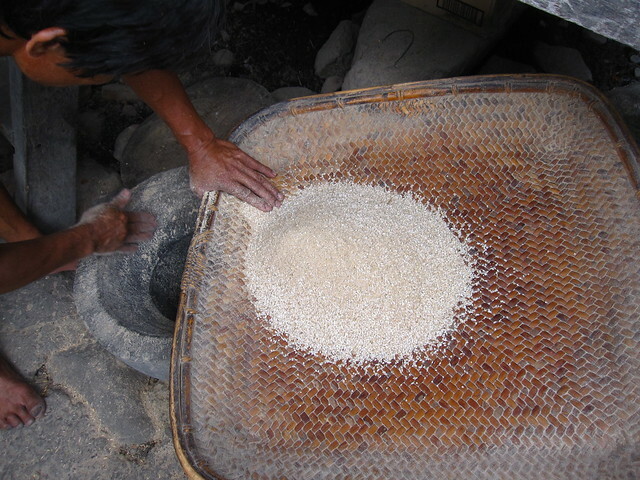 The process of pounding and sifting the rice was repeated three times, until the the grains were white on the outside and ready to be cooked. 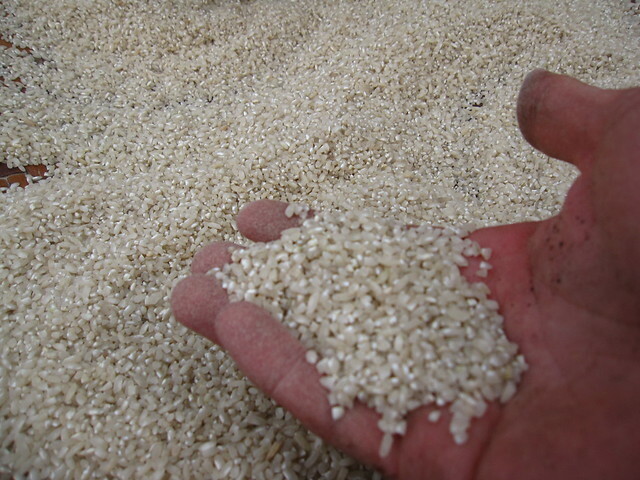 Here's a shot of the rice that we pounded, many of the grains were broken from the pounding process – not the perfect grains like when husked with a machine. After over an hour of pre-preparation the rice was ready to be cooked in a cast iron pot over a wood burning fire. Every day, the family takes a portion of the dried stalks of rice and pounds them so they have food to eat. It's not just for fun, but for life. Though my back was sore for the next few days, the meals in Batad were fantastic – simple yet fulfilling and delicious. Now I truly appreciate the rice I'm privileged to eat every day. I used to do that when I was a kid….hope you had fun pounding rice in my country. Cool Eric, I had lots of fun! Nice post and interesting photos, Mark. I visited Batad in February and really enjoyed my time in the area. It was quite an adventure just getting there! Great to hear that Don – It is an adventure getting there, but worth all the effort! Was in the area last year but din’t get to do this. Perhaps on my return this year! :) Nice post! Yah, if you get a chance to help pound rice it’s really an interesting experience. Hope you get a chance to return to Batad!